The first Stony Brook Men’s Basketball 3-pointer fell less than two minutes into the game by sophomore forward Elijah Olaniyi. By the end of regulation, Stony Brook had launched and made 13 from beyond the arc, one shy of tying a program record. The Seawolves were sharp all night long from deep on Wednesday, Feb. 6, burying the Binghamton Bearcats on the road 85-59 for their largest margin of victory in conference action this season. 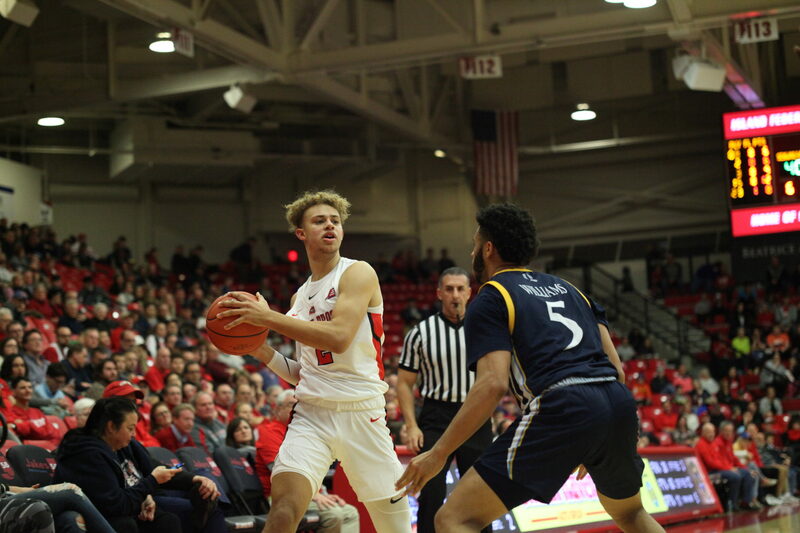 The 52 percent shooting percentage from downtown is a new season high for the Seawolves, surpassing the 50 percent mark they hit on Dec. 1 against Quinnipiac. Five different Seawolves found a shot from beyond the arc, including a career-high five 3-pointers from freshman guard Miles Latimer. Latimer took over the game in the second half and scored 14 of his game-high 19 points on five shots in six attempts. Stony Brook got ahead of Binghamton early, thanks in large part to the ball movement of the Seawolves offense. Nine minutes into the game, Stony Brook held a 27-12 lead and all five of their starters had at least five points. Every shooting option available was clicking, and the Seawolves used that to their advantage. After the game, it was acknowledged that this was an adjustment that Stony Brook was waiting to pull off. The win was a significant one for Coach Boals. Boals became the third-fastest head coach in program history to reach 50 career wins and the fastest since the program moved up to Division-I in 2000. The coach’s focus, however, was on congratulating his players for their NCAA-leading 11th road victory of the season. The Seawolves victory kicked off the second half of their America East schedule, which currently sees them in second with a 7-2 record and only a game behind first-place Vermont. This half of the schedule is loaded with home games for the Seawolves, as four of their next five matches will be held at the Island Federal Credit Union Arena.